State Sen. Andy Dinniman announced Saturday that he will support Tom Wolf in the Democratic primary for governor. EAST BRADFORD — While there are four Democratic candidates for governor, Chester County’s top elected Democrat made his choice plain Saturday, with state Sen. Andy Dinniman announcing his support for Tom Wolf. 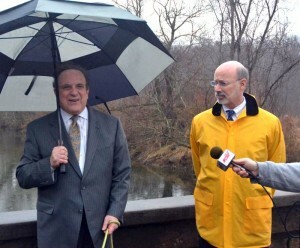 Dinniman and Wolf — who currently holds a large lead in the race for the Democratic nomination according to multiple polls — staged a joint event at the Stroud Preserve, among a series of events, the final one near the new train station in Coatesville — along with a couple of dozen supporters and local Democrats, even as wind and rain swept through the event. The location of the event, Dinniman said, was no accident. It has taken a partnership, he said, to preserve open space in the county. Wolf, from York County, suggested that Chester County’s open space preservation efforts are a model for other areas, and that he was amazed at how the residents of the county, elected officials and others came together to make it happen. As someone looking from outside the county, Wolf said he and others were impressed by the groundswell of support open space had — and continues to have — in the county. Wolf said that sometimes it takes someone seeing it from the outside to really appreciate an accomplishment. “What you’ve done here is nothing short of remarkable,” he said. Dinnaman made it clear that he feels that for those efforts to continue, Chester County needs a change in the governor’s mansion. Dinniman stressed that the next stop, in Coatesville, was the other half of open space preservation: urban redevelopment, to slow sprawl and that Wolf understood the connection — and would a strong advocate for both. That’s GREAT ANDY, now how about a CHESTER COUNTY COMMUNITY COLLEGE that districts will sponsor?